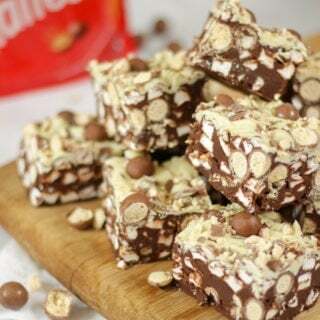 This easy Malteser Rocky Road recipe is a fun and quick No Bake Malteser Cake. Perfect as a chocolate treat for children and grown ups too, this tray bake is a take on traditional chocolate tiffin, packed with Maltesers and marshmallows. Allow the chocolate to cool slightly and then stir in the Maltesers and mini marshmallows. Melt the white chocolate and pour all over the top. Press in the remaining Maltesers.